Bordered by the Colorado River in the southeast, Arches National Park lies north of Moab, Utah and is world-renowned for being the site of over 2,000 natural sandstone arches, such as the red-hued Delicate Arch and the narrow Landscape Arch, as well as giant balanced rocks, massive fins, and towering pinnacles. The Park also features other incredible geological formations such as Balanced Rock, which towers over the striking desert landscape in the middle of the park, the North and South Window Arches and the Turret Arches. Arches National Park features over 2,000 natural sandstone arches, as well as giant balanced rocks, massive fins, and towering pinnacles. Notable attractions within the park include Balanced Rock, a gigantic balancing rock that is same size of three school buses, the Courthouse Towers, a collection of tall stone columns, the Dark Angel, a free-standing 150-foot-tall sandstone pillar at the end of the Devils Garden Trail, and the Delicate Arch, a long-standing arch which the most recognized arch in the park and an iconic symbol of Utah. 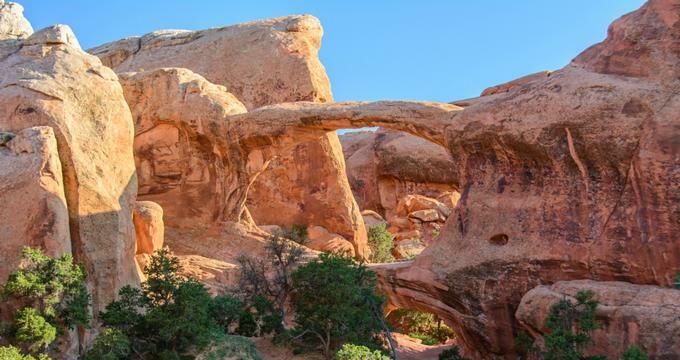 The Devils Garden, also known as The Klondike Bluffs are made up of numerous arches and columns scattered along a ridge, and the Double Arch is just that – two arches that share a common end. The Fiery Furnace is a maze of narrow passages and tall rock columns, and the Landscape Arch spans 290 feet and is the longest arch in the park. The Petrified Dunes are comprised of petrified remnants of dunes blown in from the ancient lakes that once covered the area and the Wall Arch was once an arch located along the famous Devils Garden Trail but collapsed in 2008. Recreational activities in the Arches National Park include hiking, backpacking, mountain biking, camping, auto touring, some of which require permits. Guided tours and ranger programs are also available. Various self-drive tours include driving the 36-mile round trip Scenic Drive, hiking some of the trails such as the Park Avenue Trail, the trails in the Windows Section of the park, and the trails to the Delicate Arch, the Tower Arch, the Double O Arch, and the Landscape Arch. The Arches National Park offers a variety of educational and community outreach programs for visitors of all ages, including adult’s classes, activities for children and families, Junior Ranger and Junior Ranger Archeology Program, Summer History Programs for Children, and Arches: Windows of Learning Programs. Guided walks and evening programs are offered daily from spring through fall. The Arches National Park is located north of Moab in Utah and is open daily from 7:00 am to 7:00 pm. The Arches Visitor Center is open year-round from 9:00 am to 4:00 pm and restrooms, drinking water, and outdoor exhibits are free and available 24 hours a day. The Arches Visitor Center offers a variety of information about the park, interactive displays, educational kiosks, a 150-seat auditorium where visitors can enjoy an introductory movie about the park and a bookstore with books, maps, DVD's, and postcards. Guided walks and evening programs occur daily, spring through fall. Arches have a 50-site campground, and there are several campgrounds in the area around the park. Dead Horse Point State Park is a state park near Moab that covers 5,362 acres (2,170 ha) of breathtaking desert landscapes and dramatic panoramic vistas of the Canyonlands National Park and the Colorado River. Named after a natural corral by cowboys in the 19th century, where horses often died of exposure, Dead Horse Point rests 2,000 feet above a gooseneck in the Colorado River and features several incredible overlooks, picnic areas, a campground, visitor’s center and a 9-mile (14 km) loop hiking trail. The park also features a mountain bike trail called Intrepid Trail with loops of varying levels of difficulty and is famous for being featured in the final 'Grand Canyon' scene of the 1991 film Thelma & Louise.